If you are Asian or familiar with Asian cuisine, “matcha and tofu” may seem pretty normal for you, but in the west, they are quite literally the flavour of the month. After multiple attempts, I am so glad that I have finally come up with the perfect recipe to share with you all. This is a no-bake dessert, so even if you don’t have an oven at home, it’s no problem at all. I’ve been recently obsessed with using silken tofu in my desserts – its taste is so subtle and light, yet sufficiently gives the dessert a distinctive flavour. Also, silken tofu adds to the smoothness and creaminess that we all crave in any cheesecakes. Honestly, I am not the biggest fan of cheesecakes, as I often find them too heavy and rich, but I totally fell for this one. Now the other half of this super creation; I know, I know, Matcha desserts are EVERYWHERE now, but there is a reason for that right? 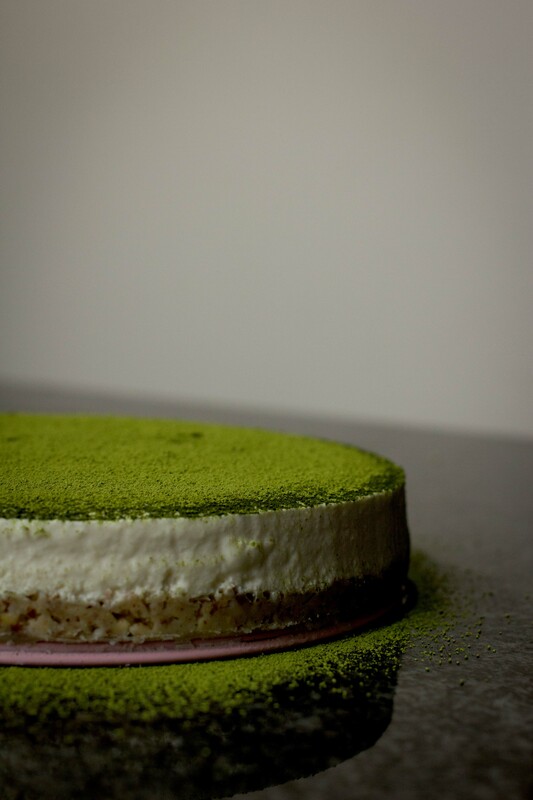 To start, I must mention that the earthy bitterness of (good quality) matcha powder acts as the perfect counterpoint of the classic cheesecake taste. Along with the coconut oil mixed nuts base (instead of the more common buttery biscuit base), you get layer upon layer of complementary flavours that in no way overpower one another. Give it a go, and thank me later *smirk*. Line an 8-inch cake pan with parchment paper. Set aside. Ground the nuts in a food processor or blender into a semi-fine texture with some crunch left. Add the coconut oil. Mix well. Evenly distribute the mixture on the bottom of the pan and press with a spoon until the base is even and firm. Set aside. Using an electric mixer or a whisk, cream icing sugar and cream cheese in a mixing bowl until the mixture becomes completely smooth and pale. Add tofu, yogurt, milk, and vanilla. Mix well. Remove any lumps in the mixture by pressing it through a sieve into another bowl. Mix gelatin powder with water in a small bowl. Slowly melt the gelatin by placing the bowl in a hot water bath; alternatively, you can microwave the gelatin-water mixture for 15-20 seconds. Add the gelatin-water mixture to the sifted cake batter. Stir well. Carefully pour the batter into the pan over the base. Let the cake set in the fridge for at least 3 hours. Remove the cake from the pan. Sprinkle sifted matcha powder generously on the cake. Enjoy! I have shared the cake with my colleages. All of them loved it. They said it was soft , refreshing and very delicious.